"Eeek! I can't wait to get on that bike tomorrow! ", I said to Lois on the night before our bike trip. We were in the middle highlands of Vietnam, where the air is fresh, the traffic is less crazy than in Saigon, the temperature is just the perfect amount of chill and where the ca phe is absolutely amazing, much to our pleasure. 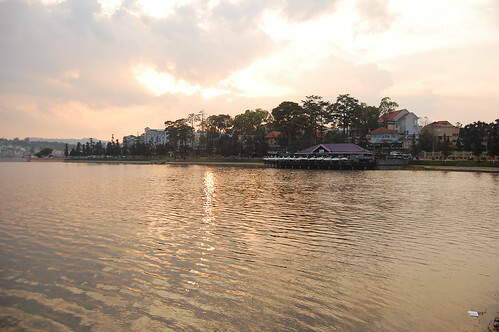 With a big beautiful lake right smack in the middle of it, Dalat was made for motor, mountain, tandem or any type of bike. 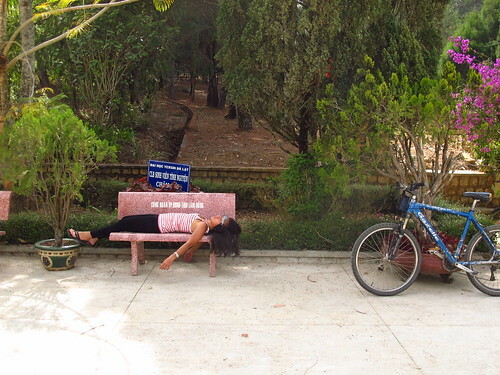 And that's exactly what we decided to do on our second day in Dalat. The day before our 'untimely deaths', we scouted for cheap bike rentals. We found Groovy Gecko Tours whole day bike rentals, from 8am to 8pm, costing us only 50,000 VND (2.50 USD). It was a good deal so we booked it right away. Those were our first words after sitting on the bikes for a few minutes. Everything went downhill from there, pun intended. The bike shop was on a bend of a street that was curving upways, downways and every which way. Not a good place to practice how to ride a mountain bike. As you may have guessed, this was the first time either of us learned the tough art of mountain biking. Both of us assumed, it was just some fancy schmancy bike without bells and baskets that boys rode just to look cool. Who would've thought that it had more gears than the NASA Discovery space shuttle STS-133? Who knew that that thing near your right thumb was to make uphill climbing easier? And that thing on the left is used to change plates? Wait, there are plates on a bike?! We were seriously screwed right from the start. To get us used to the monsters err bikes, Hutch led us around the lake in the middle of Dalat. 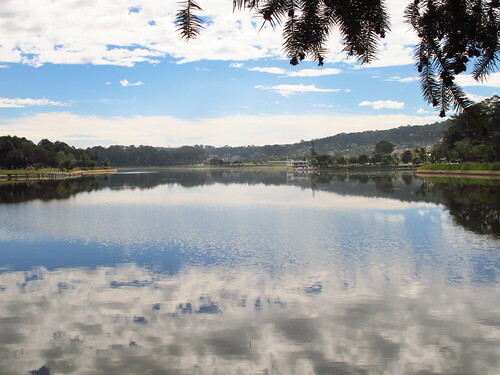 With the mountains as backdrop, the calm lake mirroring the sky, the trees and the surrounding buildings, the Sole Sisters learned the intricate details of riding a mountain bike. "To go uphill, use the small plate combined with the big sprockets. You would need less effort when you pedal. When you go downhill. you need to switch to the bigger plate with the smaller sprocket. This is the reason why mountain bikes have a lot of gears - in order to adapt to the different terrains." Hutch explained. He could've spoken Vietnamese for all we knew since both of us tuned him out. How could one remember to use which plates to use with which sprocket when one was trying hard to keep one's head from hitting the pavement? Or getting killed by the thousands of motorbikes on the Dalat streets? How would you see the plates anyway when they're BELOW your furiously pedaling feet? We can't even see our feet much less the damn sprockets! Hutch probably has the patience of the Dalai Lama, Mother Teresa and Buddha combined because he was able to control his urge to strangle both Sole Sisters and leave our carcasses on the streets of Dalat. We practiced with shifting gears and whatchamacallits. It was harder and harder to concentrate when we had this huge distraction surrounding us. 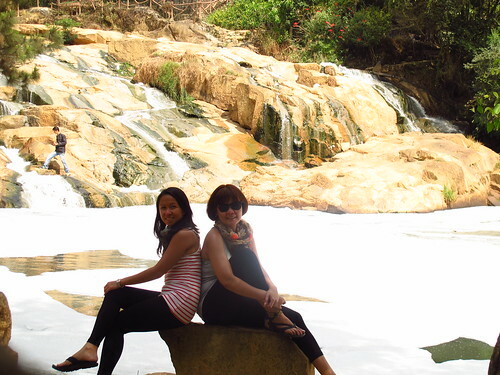 We furiously pedaled with our pretty feet but sometimes missed a beat because the beauty of Dalat sometimes got too overwhelming. Finally, after almost an hour of trying to hard to remember which type of sprocket went with which type of plate, we deemed ourselves ready to head on to Camly waterfalls, which was to be our first stop, and the BIG grandaddy waterfalls, which was 6 kilometers away. And then...it looked like it was about to rain. Dark clouds began to hover around the horizon. Was the Universe telling us something again? I confidently said 'Of course, we're going to the falls! Kiver sa weather." Those turned out to be my famous last words. Getting to Camly WATERFALLS was a breeze. Forgive the all-caps, I couldn't resist because it was a joke of a waterfall. It was so far from being a waterfall as a 3-in-1 Nescafe coffee is far from being a Vietnamese Ca Phe Sua Da. It turned out to be a sewage masquerading as a tourist attraction. What a hoot! The only good thing about that part was we got there in one piece. 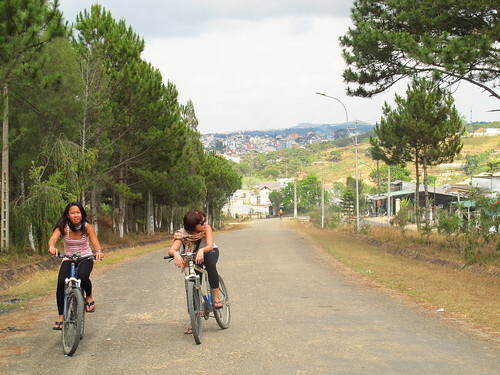 We survived biking the winding streets of Dalat. Our 2nd destination was another story all together. The Dalat War Memorial was only 1 kilometer away from the Camly WATERFALLS (Oops there go the all-caps again, forgive me.). Yet, for the Sole Sisters, every pedal made was agony, every meter life-threatening. The road was winding slowly upwards. It was a slow agonizing death, one painful degree at a time. Lovely though they may be." haha, you sisters really crack me up. For awhile, I thought I was in a hardware store with you gals talking about sprockets and plates! talbog talaga sila sa WATERFALLS natin! -- all caps pa yan! haha. hahahaha. i feel you, sisters. i just got my mountain bike and had difficulties in the first few days. i got the hang of it after a week. XD cheers from cebu! That was a joke of a waterfall talaga! You're right, we burned a whole lot of calories, felt like ALL the calories were burned by that freakin' bike trip. And here I thought it was just an ordinary bike without the bells and baskets. Boy was I wrong huh? Reading your blogs with smiling face makes me crave for moreof your stories. Need more input. I am back now from HCMC. Regards to all and Hutch. Met him in one of dinner meet up. Watch out for more stories in the next few weeks qtpie! Thanks for following our journey! Who knew that bicycles could be so complicated? I have no idea where a sprocket or plate would be on a bike. I can pedal them and know how to put on a chain, but that's about it. At least you picked a good city in Vietnam to bike around. I was in Dalat for a couple of days and I thought it was a nice, scenic place. It didn't have as chaotic of streets as Saigon.